We recently looked at how mobile has emerged as a crucial audience source for Facebook, Twitter, and Pinterest. But what about LinkedIn? All of LinkedIn’s competitors have seen significant growth in the size of their mobile and mobile-only audience as a percentage of their total audience. 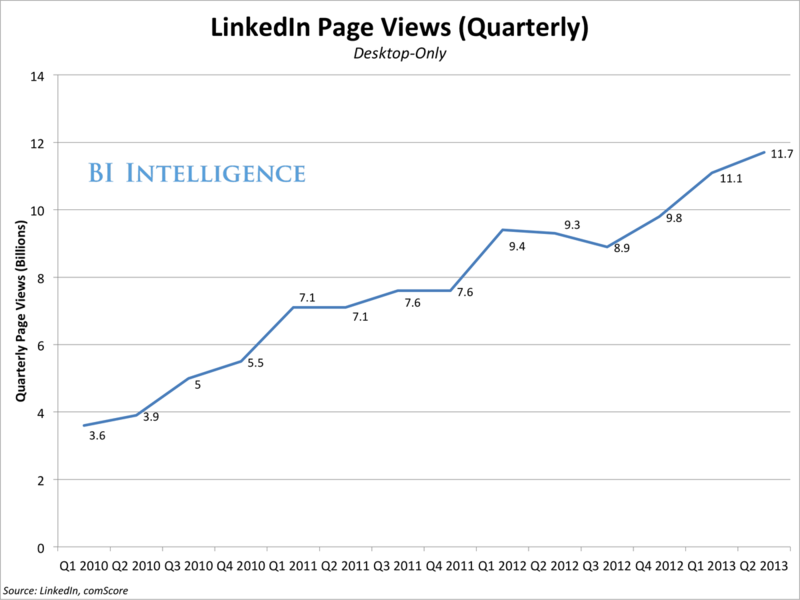 But LinkedIn has not seen that shift, according to comScore data. In fact, the percentage of LinkedIn’s monthly active users who are mobile or mobile-only has remained unchanged since September 2012. 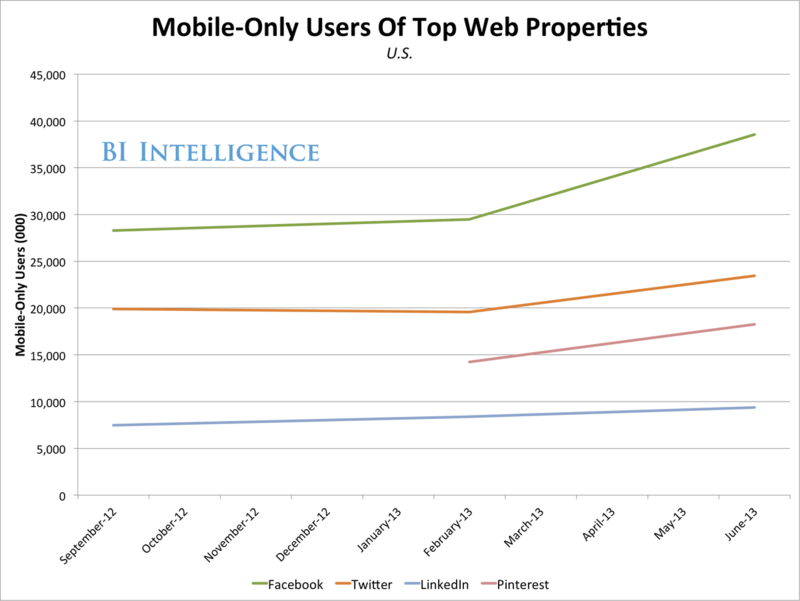 In September 2012, LinkedIn’s audience was 29% mobile and 16% mobile-only. Nine months later, the numbers had not budged. Twenty-eight percent of LinkedIn’s unique visitors in the U.S. accessed the site via a mobile device at least once during the month of June 2013; approximately 16% visitors were mobile-only. Meanwhile, 60% of Facebook’s total monthly active users in June 2013 accessed its site on either a smartphone or tablet, compared to 51% in September. LinkedIn recently upgraded its iOS and Android mobile apps to allow users to apply for jobs on the site while using a smartphone or tablet. 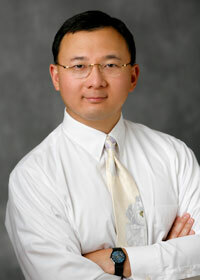 The upgrade may boost mobile engagement as well as the efficacy of recruitment ads on mobile. The chart below shows how mobile-only usage at the other social networks has shot up while it has remained relatively flat at LinkedIn. People love to advertise their experiences. Social media is more or less about the marketing of the self, and so the move of Grey Goose to host its interactive Hotel Noir campaign on social upstarts Pinterest and Instagram makes complete sense. Luxury is embedded in this brand’s story, and they know it. Just watch the film paired with the campaign; it’s that coy and elusive drama that intrigues you and convinces you that you’re missing something crucial. It’s romantic. It’s private, captivating, and calculating. This aura is designed, and it’s the same aura many people seek to create about themselves through social media. But is it working for Grey Goose? It very well may be. The 3rd and 4th highest volumes of incoming traffic to GreyGoose.com are off Facebook and Pinterest respectively. Looking at the unique visitors to the site, we can see a distinct upward trend coupled with a rise in the average stay on the site. More people are spending more time on GreyGoose.com over the past three months. This speaks to engagement, content, and interaction. The reason this campaign could be working is because Grey Goose knows who they are appealing to. Looking at their online demographics (below), it’s clear their audience is predominantly young, between the ages of 18-34. This generation loves social media, but more importantly knows how to use it and collaborate across platforms. That’s why a campaign that uses Pinterest in tandem with Facebook in tandem with Instagram in tandem with a branded site can work. Essentially Grey Goose has found a way to captivate its audience and inspire them to advertise for the brand by generating a story that is alluring to online consumers. The campaign asks users to submit photos within the motif (an elegant black and white motif, accents blushed to crimson) through Instagram that can then be displayed on other platforms (like Pinterest and Facebook). People are promoting themselves in the same instance that they’re promoting Grey Goose. All Grey Goose had to do was create that crucial air of mysterious luxury, and the need to partake in the exclusivity would propel the rest of the campaign. This is already the draw to Instagram, where users select only the most delightful aspect of their lives to be photographed, filtered, gussied up and shared. Each photo is part of a meticulously constructed online identity, handpicked and refined so that it more-or-less represents how a person prefers to be represented rather than the actual person themselves. And that’s fine! It’s already how people behave in most in-person social situations, so why shouldn’t the phenomenon of self-construction exist online? And since it is online, why shouldn’t a brand already exquisite in its classy aura take ahold of it? Good show, Grey Goose, good show. Facebook Monthly Unique Visitors and Pageviews are down. Interestingly, the use of Facebook dropped over the holidays, implying that many people use it at the office and during work. I had been eagerly awaiting the start of the Patriots season since their heartbreaking loss at the start of the year. The first Monday night game in September I got to see my favorite team back in action, along with my favorite player. What I wasn’t expecting was to see Tom Brady off the field as well, advertising footwear during one of the game’s commercial breaks. I loved the commercial, and not just because it made walking around aimlessly look incredibly cool. It brought a new dimension to a brand that I remember seeing only on girls walking around campus in the winter. Forgetting their origin as Australian surfers’ footwear, Uggs are now so tied to their classic boot look for the female demographic that I can’t imagine them breaking into the male market significantly. Well after a month of walking around Boston seeing Brady’s image posted on buildings (and I’ve heard they’re in other cities, as well) I wondered what kind of boost the brand is getting from the campaign. While the trend looks the same, with the traffic starting to pick up for the holiday season, uggsaustralia.com has a whopping 237,887 more unique visitors than it did in September last year, a 48% increase. There has been an overall increase in traffic year over year, but that difference was only 23% in July before the ad campaign started. Also, more people online seem to be going to the site. The trend has steadily been on the rise, with some significant peaks since the commercial started airing in September. The most important question, though, is what kind of effect is Brady having on driving the male demographic to the site? There isn’t a major increase during September, but it’s up 2% year over year in the male demographic. The beauty of the campaign is it may be targeting females just as much to get the shoes for their guys as gifts during the upcoming holiday season. After all this, it’s still hard to tell if the campaign is having a significant effect—the next few months will give us a better idea. But I think I might get a pair. If Tom wears them they must be cool, right? That is a year-over-year increase of 18% and 23% respectively. Assuming the population of the world does not change that much year to year, the change in total unique sessions leads to the conclusion that online usage continues to increase noticeably. Well, this is strange. January 2010 numbers from Nielsen reveal Google has 66.3% of the search market, while Yahoo has 14.5% and Microsoft has 10.9% across its various properties. Google is 4x more than Yahoo and 6x more than Microsoft.